Did you know that the creative industry grew in revenue from $30.1 billion to $44 in 2016? Reason being, Americans are increasingly regaining interest in the simple, sweet things in life, such as hand-dipped candles, heat-pressed t-shirts, handmade birdhouses and so on. What do these stats indicate? It’s easy – the market is vast, and if you promote your business properly, you might make lots of money. The best thing is, with the creative industry, you can operate from home, and get to have a better work-life balance as well as get to be your own boss. Without further ado, we’re going to give you ideas on crafting businesses that you can start and run from home with a minimal capital of around $0 to $5000. If you’re interested in clothing design, then t-shirt designing is something you should really consider going into. This is one of the most flexible crafting businesses in that you can do heat pressing, screen printing, direct to garment printing, and so forth. Moreover, it’s inexpensive to start but very profitable. If you know the current trends or what customers want, then designing t-shirts will be a breeze for you. You could print pictures, numbers, quotes, names, and more onto the t-shirts or operate on an order-print basis where customers tell you what they want and you print their preferred designs. This doesn’t necessarily refer to the traditional toy building process where bolts and nuts are used to create toys from scratch. Though building toys from scratch is okay, an easier and more effective means would be to create them from materials that you already have. We went on a trip to Africa, and we found people there creating toy elephants and a few other items from flip flops. Others were using wires to create fantastic toy cars, and the business was booming with customers from within the continent and beyond. Just look and see what you have lying around your home and see what you can make from it, and if your work is impressive, you can be sure that people will want to buy from you. Recently, we wrote an article on how to start your own tailoring business, and we think you should check it out. The thing with designing clothes or rather fashion design, in general, is that there are numerous customers. Nonetheless, huge brands like Gucci have ventured into the business, making it very competitive, so you have to be very good and perhaps have a little training. On the brighter side, not many people are satisfied with what the big brands are offering. Some folks find the prices unreasonably high, and others just want something that offers them better customization, and these are the gaps you should focus on to make it as a small-scale fashion designer. Study the kind of designs your customers wear and try to go with the times, like Halloween, Christmas, Summer, Winter, Spring, and more, creating designs that go with the season. People love giving and receiving gifts, but what they love even more is an opportunity to exchange gifts in a new and stylish manner. If you can handcraft gift baskets in some African or Indian style, or in any style that appears different, then you could find lots of people getting interested. With Amazon, Etsy, eBay, and other online marketplaces offering you a vast market, all you need to worry about are the supplies and the skills. These days, many people are turning to beaded and other handcrafted jewelry because of the associated uniqueness. The first consideration to make is whether you know how to make decorative adornments. You also need to have a good supply of the raw materials but this is not much of an issue because you can just purchase some from eBay. As with other businesses, it is imperative that you find a good market for your handcrafted items. Craft fairs, in-home shows, retail shops, and online stores like Amazon and eBay all offer you a perfect opportunity to get customers. Today, it is very hard to see a woman who doesn’t carry a hand bag, and you know what that means? The hand bag business has a huge market, and as long as you have the skills to make something attractive, you won’t lack customers. For starters, make hand bags for women alone but as your business grows, consider making bags for other people as well, like school bags for kids or even wallets for men. If you’re targeting local customers, then you had better make sure folks in your area love and actually keep pets, but if you’re planning to ship them to different places, then there’s nothing to worry about. This is a very wide area, as there are many types of pet houses you could make. You could, for instance, make little dog houses or birdhouses. The good thing is that pet owners are very concerned about their pets’ comfort, and they’re willing to spend lots of money on their houses. 1. Are craft businesses really profitable? Of course, it will depend on the kind of craft you’re talking about as well as your marketing efforts. 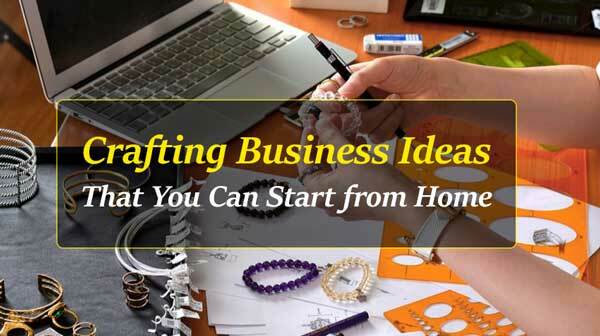 But due to the resurgence of interest in homemade items, business is booming for crafters, and it is possible to make 2000 to 10000 dollars a month as a homebased crafter. 2. Where can I sell my homemade items? 3. How much will it cost me to sell professionally on Amazon? Currently, the monthly charges for the professional selling plan are $39.99, but for the period running through the 31st of December 2019, that fee is waived for Amazon Handmade artisans. 4. How can I start my crafting business from scratch? The first thing you need to do is identify what you’re good at or interested in. It could be designing clothes, styling hair, making bungles, writing web content, making colored candles or lava lamps and so forth. Make a list of all the things you can or would like to do. If you are interested in a certain craft but don’t know how to do it, use YouTube as well as web articles as your guides to help you do it. After that, get the capital and gather the materials needed, and if a license is needed, get it before starting your business. 5. Where do I get money to start my craft business? This article only highlights the homebased businesses you can start and doesn’t really give you the details of what each of these businesses entails. If you’re to succeed, it would help if you dug a little deeper and found out the things needed to start them, including the finances and the legal documents or licenses. Again, be sure to apply digital marketing to broaden your reach into the market. Consider creating a page on Facebook and sponsor it to help clients discover your products or services. Don’t forget to do social media marketing on other social networks including Twitter and Instagram. And, lastly, ensure you do local SEO to help local customers find your business. We hope you enjoyed the article. Please share it with your friends around the web.